Launched in January and on sale since February 16, the Adapt BB are shoes that can automatically adjust to keep the shoe tight, as soon as the wearer slips it on. While there are manual buttons to adjust the tension, it can also be controlled via a companion app, with each shoe able to be adjusted individually. In its first week of availability, CNET reports the shoes required a firmware update to be applied, one which could only be performed via the iOS or Android app. It appears that, at least in the Android app's case, there were issues that weren't picked up, which has led to users complaining in reviews for the Nike Adapt app on the Google Play Store. Many of the complaining apps advise the app will only connect with one of the shoes and not the other, as well as effectively disabling the main ability of remotely adjusting the shoes. 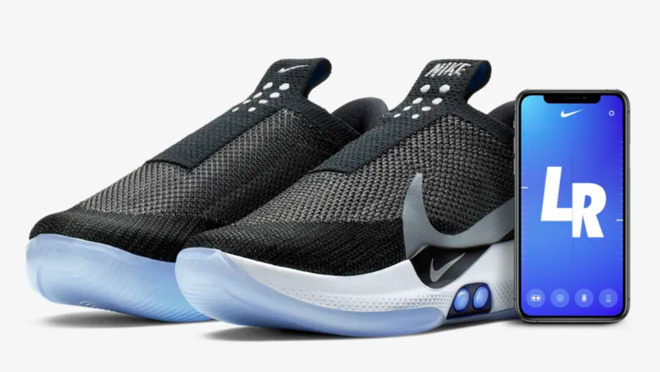 In some cases, suggestions to follow Nike's own troubleshooting process, including performing a hard reset on the shoes, does not seem to solve the problem. By contrast, owners using the iOS app do not appear to have suffered the same issue. While in many cases bricked hardware turns devices useless until they can be fixed, owners of the $350 Adapt BB are still able to wear and use the sneakers until Nike provides a solution. Nike has yet to comment on the issues. Are you waiting on the self tightening girdle? WHY THE FU** is there an android app???? Perfect example of the pathological use of technology. This sort of technology could be useful for Diabetic compression wear. Instead it's a novelty. You definitely don't want bricks in basketball. It's the 21st century update on the old Reebok Pump shoes. Nike was apparently blinded by tech and didn't really THINK about this. First they are not self lacing. They are shoes that adjust the fit. But why would you want to pull out your PHONE to do that? Why would you want shoes that need to be charged to do that? This is a several hundred dollar solution to a twenty dollar problem. This is a fix that is a hundred thousand times more complicated than it needs to be. so neither Nike, nor anyone else will think about doing this again. Hard reset on the shoes so it reboots. That hilarious. I could just hear the Mac restart sound when it reboots.